Recently several Young Adults have come forward asking to have some kind of gathering connected to our Church. We want to spread the word so we can make this an opportunity for any Young Adult associated with our parish. When we say Young Adult, we mean anyone who is out of high school and under 30. We are hoping to build a small Christian community for people in this demographic. Share this with anyone who you would think be interested and encourage them to attend. The first event will take place on June 4th, at 8pm. We will gather to watch the movie “The Way”, which shares the story of one man traveling the Camino de Santiago. We will even have 2 people who completed the Camino share their personal stories. The event will take place at the home of the Fahy’s (117 Edgewood Way, Pewee Valley) just up the road from Church. Come and see what its all about! 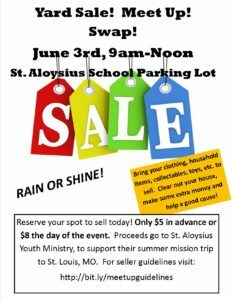 To RSVP or to ask any questions, contact Mary Hynes at the Parish office. Everyone is invited to attend our annual Great American Country Picnic! Join us for some fun in the sun July 15, 1-11pm! We will have Booths, Prizes, a Kidway, Beer Garden, and much more! And don’t forget our Chicken Dinner featuring our Famous Noodles! Enter to win this year’s Capital Prize: A $50 ticket gets you a chance to win a 2017 Ford Mustang or $15,000 (winners choice)! We also have a Handmade Quilt Raffle, at $5 a ticket! You won’t want to miss a minute of the FUN! Click HERE if you would like to volunteer to help make our Picnic a success! 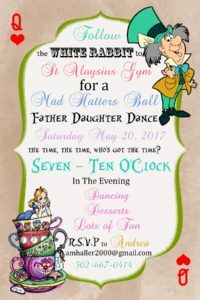 Tickets are now on sale for the 2017 Father Daughter Dance. The dance will be on May 20th, at 7pm in the Gym. The cost is $10 for one daughter and her daddy, $15 for 2 or more daughters. Tickets can be purchased at the Parish Office. See the flyer for any additional information. 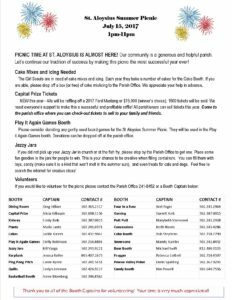 The Summer Picnic will be July 15, 2017. We already have started getting things ready. See the image for a complete list of how you can help with Picnic and who to contact. And don’t forget to get your Capital Prize tickets! Capital Prize tickets are available for purchase at the parish office. A $50 ticket gets you a chance to win a 2017 Ford Mustang or $15,000 (winners choice)! Tickets can be picked up at the office to sell to friends and neighbors! https://www.staloysiuspwv.org/wp-content/uploads/2016/08/header-logo-3-300x153.png 0 0 Mandy Kumler https://www.staloysiuspwv.org/wp-content/uploads/2016/08/header-logo-3-300x153.png Mandy Kumler2017-05-03 15:44:242017-05-18 16:01:53Summer Picnic 2017!! !